Cooking time: few mins. to heat water for jelly. 1. 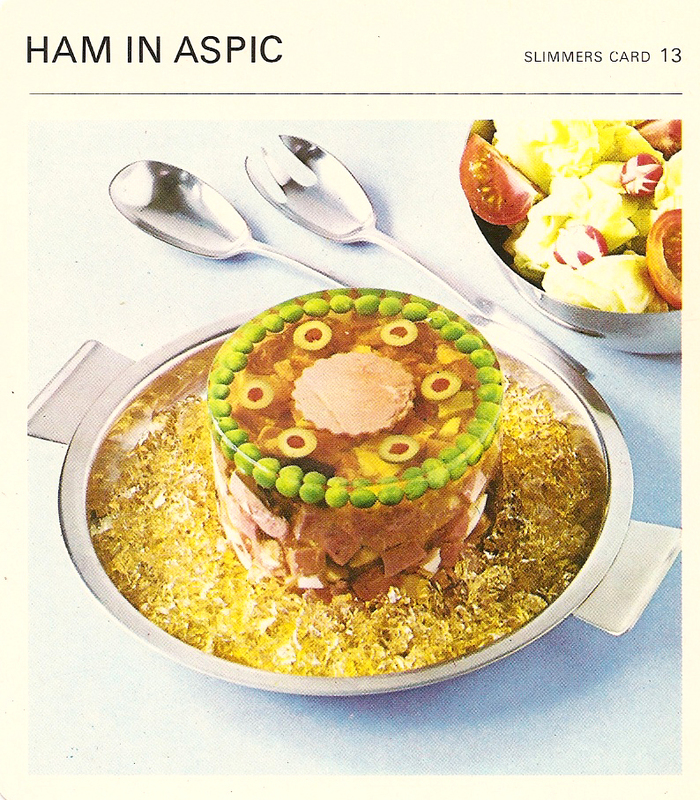 Pour in enough aspic jelly to give 1/4 inch layer at the bottom of the mold. 2. Allow to set, then arrange the sliced olives, peas, and white egg on this, then cover with a very little more cold jelly. 3. Put this into a cool place to become quite firm. 4. Dice the ham, pit and chop the prunes and mix with the chopped eggs and yolk. 5. Put this into the mold; then gently pour in enough cold, but not set, aspic jelly to cover. 6. Put into a cool place for the mold to set and allow remainder of the jelly to set separately. TO SERVE: Turn out, garnish with the chopped jelly, and serve with a green salad. TO VARY: Use half tomato juice and half water to set the jelly. TO STORE: In the refrigerator. To turn out a mold: Dip for a few seconds only in hot water, then invert over serving dish.